Wearing pink for breast cancer, or buying pink products, is a demonstration of your support for the enslavement of women by a highly-unethical industry that seeks to turn women's bodies into profit centers. Wearing pink shouts, "I support the ignorance of women! I support Big Pharma! I support male-dominated corporate control over the health of women's breasts!" Buying pink products sends the same message. Whether it's a can of soup, a pair of pink batteries or even a pink "vacation" (yes, they do exist), these products are jumping on the pink bandwagon for one reason only: consumers buy it. Painting any product pink results in a sales surge. The marketing push for pink products is so strong now that many companies selling products that actually cause cancer have jumped on the pink bandwagon! It's a practice called "pinkwashing," and when you see things like toxic cosmetics and chemically-manufactured personal care products sporting the pink ribbons and pledging to support breast cancer research, you have to stop and ask yourself the obvious question: Don't these products actually CAUSE breast cancer? Yes, many of them do. The truth is there's no accountability in the donations stemming from the sales of such pink products. Buying a can of soup branded with a pink ribbon, for example, may generate a whole of two cents in donations. And where do those donations go? Are they spent on nutritional education programs for women? Of course not - they often go into the pockets of pro-pharmaceutical non-profit groups (like the Susan G. Komen Breast Cancer Foundation) that have very strong ties to drug companies and actually receive much of their funding from those companies. In effect, these are drug company "front groups" that engage in disease mongering and push mass screening in order to multiply the number of people being "treated" for breast cancer. The only allowed treatments, of course, are those that financially benefit the drug companies and conventional medicine practitioners. The solution? Think before you pink! 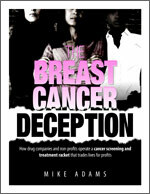 See the website of the honest non-profit, Breast Cancer Action, at www.ThinkBeforeYouPink.org to learn more.